We are proud to announce that we will be hosting the VIP AREA of the new Vestiville festival in June! Cardi B // ASAP Rocky // Migos // Future // Nicky Jam // Meek Mill // Tory Lanez // Lil Pump // Maitre Gims // Lil Baby // Davidoo // Jacques // DaniLeigh // Saweetie // Niska // Vegedream // and many more. 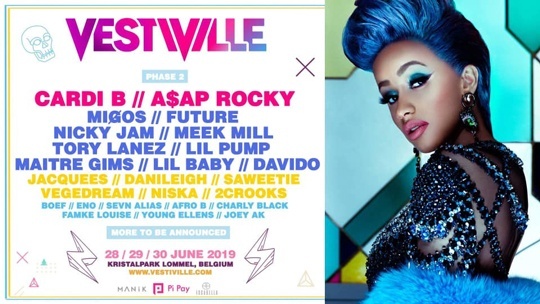 Vestiville is coming to Lommel, Belgium on 28, 29 & 30 June 2019! The new kid on the block will be a 3 day festival and is positioning itself to become the premier urban music experience in Europe.